I have been doing some reading on The Forge that led me to a few RPG design blogs, Socratic Design and another that escapes me. That inspired me to relate some of the design ideas behind Of Gods and Relics (OGAR). This was a big pet peeve of mine. Although for some games character creation is the most fun and important part of the game (Traveller comes to mind, in any form I have played). One thing I have noticed with what I’ll call “Front End” heavy games. They tend to bog down very quickly – at least in my experience. The more time you spend creating a character the more detailed and complex the character sheet, record keeping, and actual game play seems to be. So, I wanted character creation, and adventure creation, to be as simple as possible while supporting the other goals. OGAR is a fantasy game. If I get my way in this world, there will be plenty more books for OGAR, a modern spy game based on the Power of 12 (the game system underneath), as well as a Sci-Fi game. Sticking to fantasy for now and the world of Malaforcia (the game world I built for OGAR) I wanted the roles (fighter, rogue, priest, bard, ranger, scholar, etc) to be role-played to satisfaction and be roughly equal to one another in their ability to succeed, to affect the world around them. Too many times have I sat at a table with good friends (even passing strangers) and in the midst of a great role-playing moment we all had to pause for up to 15 minutes to look up some obscure rule. Too many times have I had to dejectedly admit that, despite such great role-play, there is no way your character can do “that”. Combat can ruin Diplomacy. But Diplomacy can never ruin Combat. I wanted to make those two sides even. Just because I heavily favor role-play and flavor, does not mean I don’t want to roll lots of dice! I just don’t feel that a calculator should be necessary. Rolling dice is, in itself, a feeling of great power. Rolling a single die seems anticlimactic. Rolling six or twelve dice. Now we are talking! A handful, it FEELS better. Again, while supporting the other goals. Every time I play Shadowrun (4th Ed. was a bit easier on the math skills), Traveller, or Pathfinder (among many others) I need a spreadsheet or computer program to not only track my character correctly but the interest and principle on our star ship loans or the dice I get to roll for primary control of a ground drone on my subscriber list. Pathfinder is a jacked up D20 3.5 (3.75 I have heard in jest) but just to level up, it really helps to have Hero Forge handy. All these games have arguably good systems and great mechanical detail for everything you would want to do. You just have to know where the rule is at the time you need it. I felt that, if you needed a multi-page index AND a glossary summarizing the rules… there must be too many rules. I wanted my game to be playable from the character sheets and the prepared adventure, without calculators or other computer aids. And the game must still inspire people to play. I’ll post more of my behind the scenes design thoughts in the near future. I just wanted to give some folks asking a few tidbits of where the game and system got its start. OGAR is available in Print! Of Gods and Relics Vendai is now available in print from our store! OGAR is at the E-Store! 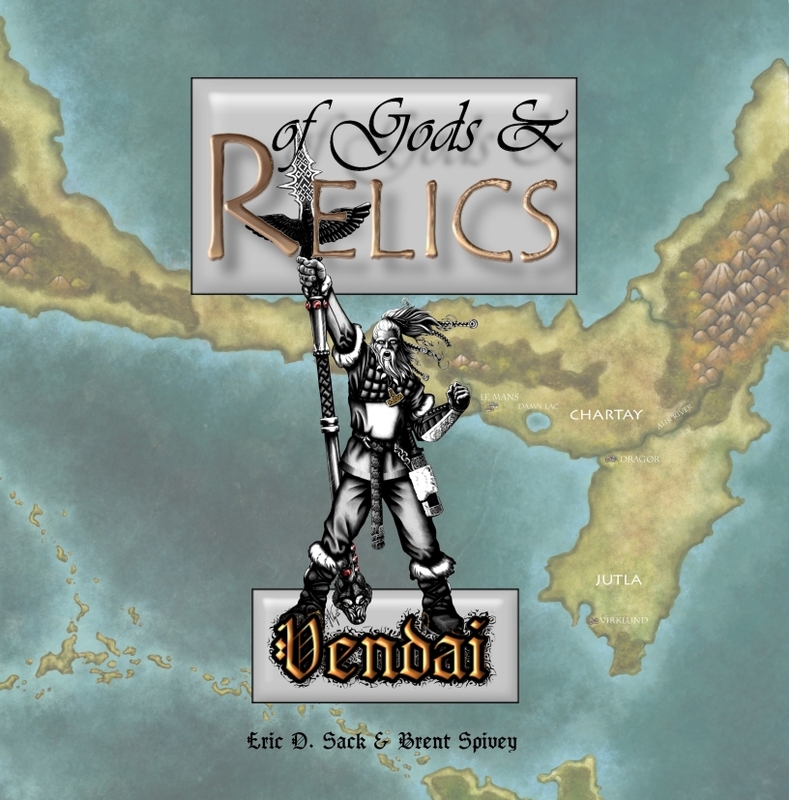 Of Gods and Relics Vendai is available now at the E-Store (see our web site at http://randomencounters.net for more details). It has been a long time coming. I started this project back in 2004. I’ll post some history on that soon. What do you think of the front cover? Character Sheets will be added as a free download! Soon we will be adding character sheets to our e-store as a free download. These will be 8.5 x 11 with more room for Potestas and Macula (perks and flaws) and suitable for framing (framing is, of course, optional).